The Silberman School of Social Work proudly congratulates Adjunct Assistant Professor Antonio M. Young, a 2018 recipient of the Latino Social Work Coalition and Scholarship Fund Leadership Award. 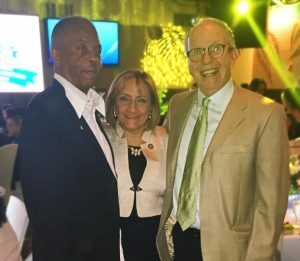 Professor Young was honored at the Coalition’s Annual Gala on April 26, along with fellow Leadership Award winner and SSSW alumna Leslie Jeanette Marroquin-Soto (MSW ’06), among others. This esteemed award recognizes outstanding leadership and service in the Latino social work community. It is a fitting honor for Professor Young, a longtime faculty member and contributor to the Silberman community who is highly committed to his students’ success. Congratulations!